Glasstown, the first stage play written by Australian Noel Robinson, is about the Brontë family and the play takes its name from the imaginary world they invented as children. The story covers a year in the family’s life at Haworth parsonage during which Branwell, the only son and bright hope, self-destructs while the three sisters emerge stronger, their experiences influencing the writing of the novels that made the Brontë name famous. The production received its world premier at the Arts Theatre, Cambridge, with Anne taking the lead role of Charlotte Brontë. Two other popular television actors also appeared: Robert Powell (Doomwatch) as Branwell and Angela Down (Take Three Girls, War and Peace) as sister Emily. 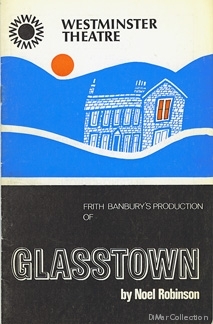 Glasstown ran for a week at most venues, with six evening and two afternoon performances. Click on each town below to read reviews from the local papers; there is also a review from trade publication The Stage for Cambridge. 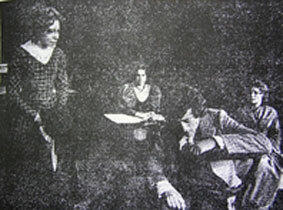 Some of the papers included interviews with one or more of the cast, including Anne. Click below to go to the Interviews and Articles section to read an interview given during the tour in which Anne gave her reasons for leaving The Onedin Line. As well as the newspaper articles, Anne was interviewed on local television station HTV Wales & West whilst in Swindon, and probably undertook some radio interviews elsewhere about the play. 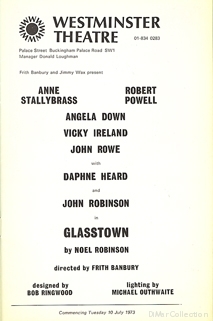 After a ten week tour, Glasstown transferred to the Westminster Theatre in London where it had forty-seven performances, finally closing on 11 August. 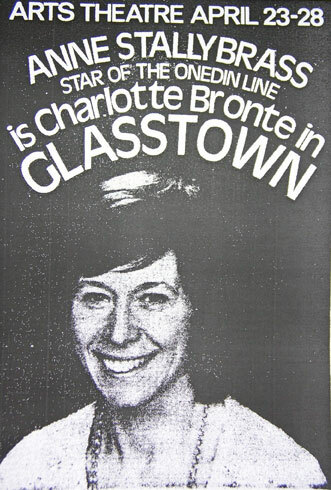 As can be seen, Glasstown and Anne’s performance were extremely well received, with the production breaking box office records in Cambridge, where it played to capacity houses at every performance; it did similarly in other towns.